Watching the sun sink below the horizon of the lake in Wood-Tikchick State Park, my husband and I joined our host, Glenn Elison, raising glasses of excellent whiskey to toast the day of fishing in this beautiful area of southeast Alaska. With migrating salmon, huge rainbow trout, and grayling grabbing our flies, it was truly an epic day. At the time, Elison was the Alaska state director of The Conservation Fund (TCF), and my husband and I were there to gather material for articles on work TCF was doing to protect wildlife habitat in the state. Having recently retired from the US Fish and Wildlife Service in 2002, Elison was embarking on his second wildlife-centric career. Today, Elison and his wife, Denice, reside in Lewistown, where he continues to work for Montana outdoor recreationists and wildlife in his efforts with the Public Land and Water Association, whose focus is to provide access to all public land and water in Montana. In recent years, new landowners have often blocked traditional access through private property to reach public land and water. To an avid hunter and angler like Elison, PLWA is the perfect place to volunteer his expertise to help all Montana’s recreationists. The road to Montana retirement certainly prepared Elison for this next chapter in his life. After college, a tour in the Navy landed Elison on Adak, an Aleutian Island off the northwest coast of Alaska. In 1975 when his enlistment was done, Elison stayed in the Aleutians with a summer job for USFWS, trapping and hunting nonnative Arctic foxes, which were decimating native birds on the islands. He was clearly bit hard by the Alaska bug, so that fall he enrolled in a Master’s degree program at Washington State University with a research emphasis on rock ptarmigan nutrition in the Aleutian chain. After graduation, Elison went to work for the USFWS, and he and Denice were stationed at a remote Nevada wildlife refuge. Denice had the dubious honor of traveling 120 miles round trip once a week to get groceries and pick up mail. After the couple spent three years in Nevada, the USFWS transfered them to King Salmon, Alaska on the salmon-rich Naknek River. This river sees millions of salmon returning each fall to spawn in its pristine waters. Elison’s next posting as manager of the Alaska National Wildlife Refuge from 1983-1993 was a dream come true. This wild, immense refuge was paradise for Elison and his wife. “My best memories of this time are of us floating and fishing pristine rivers, backpacking in wild country and the myriad hunting opportunities Alaska offered,” he said. But according to Elison, his “sharpest” memories are of the politics surrounding the assessment of the Arctic Plain within the refuge for gas and oil exploration and development. “There was a huge amount of political activity around this issue, and we hosted a couple hundred Congressmen and 30 or more Senators to help them understand the complexity of the situation. They just don’t teach that kind of engagement in grad school,” Elison recalled. As a result of his thorough handling of the Arctic Plain issues, Elison was named State Director of all national wildlife refuges in Alaska. This position involved overseeing each refuge plan, employees, policy, budget, and management of the migratory bird program for the entire state system. And then the Exxon Valdez oil spill happened. The acquisition part of the mitigation money threw Elison into the real estate world, evaluating property and negotiating sale agreements. When he retired from USFWS, he went to work for The Conservation Fund (TCF) as the Alaskan Director, realizing he enjoyed working the real estate angle of conservation. Elison said a crowning achievement working with TCF was the protection of the entire four-mile length of the Agulowak River where 1.2 million sockeye salmon come to spawn each fall. During the summer as a full-time employee and now as a part-timer, Elison took potential donors on wild Alaska river fishing trips, immersing people into the outdoors to help them internalize emotionally the importance of habitat conservation. 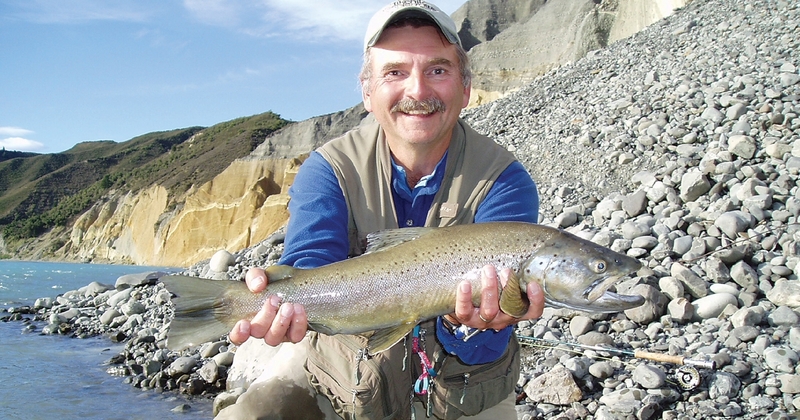 Even in retirement, Elison has remained committed to making the outdoors accessible to people. His work with Montana’s Public Land and Water Association clearly shows this. “There’s been a proliferation of blocked access to public land and water as ownership of land has changed over the years, typically when a wealthy, out-of-state buyer steps in. At that time, the new owner often closes access points that the public has used for decades,” he said. Blocking historical access to public lands affects all outdoor enthusiasts from hunters, bikers, anglers, skiers, hikers, birders, and wildlife watchers, so everyone has a stake in this fight. This is when PLWA steps in with its considerable research and legal expertise. According to Elison, the success rate in these lawsuits is very high, including victory in four cases that have gone all the way to the Montana Supreme Court. With their passion for wildlife and public access to public land and water, Elison and Denice feel they have found Lewistown to match all the things they enjoy about the outdoor life and community service.